Jurgen Klopp has named his Liverpool side for Saturday evening’s clash with Bournemouth at Anfield, making one change from Tuesday night. The Reds return to Premier League action after their euphoric 5-1 aggregate victory over Man City in the Champions League, looking to keep their excellent run going. Still fighting for a top-four finish in the league, Liverpool can maintain the gap between them and fifth-placed Chelsea with another three points at home. 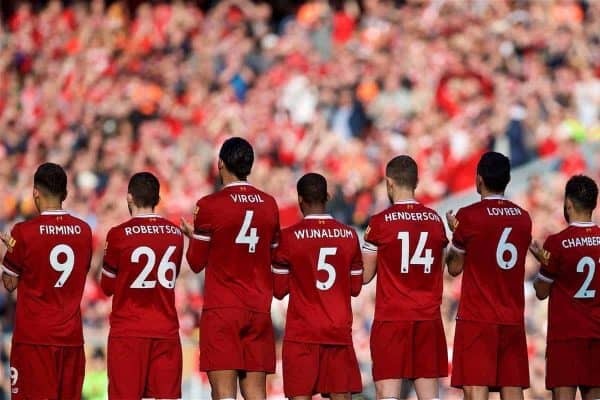 They take on a Bournemouth side who have won just once in their last six games, and still unbeaten at Anfield in the league they can head into the 5.30pm kickoff with confidence. Despite his players’ European exertions, Klopp has largely kept the same side from the Etihad, with just one alteration. Loris Karius remains in goal, with the manager going all in on his new No. 1, who has so far kept 13 clean sheets and conceded just 19 goals in 25 games this season. He lines up behind a back four of Trent Alexander-Arnold, Dejan Lovren, Virgil van Dijk and Andrew Robertson. Jordan Henderson returns in midfield after sitting out the victory over City due to suspension. The captain is joined by Georginio Wijnaldum and Alex Oxlade-Chamberlain in the middle of the park. And in attack, Mohamed Salah, Sadio Mane and Roberto Firmino are tasked with providing the goals against the Cherries, who have shipped the joint-fifth most goals in the league this term.